By changing my point of view—zooming in, or stepping back and looking from a great distance—I find intricate patterns in the world around me. Whether looking closely at the human body or looking above vast miles of agricultural landscape, the patterns I find guide me to a greater understanding of a multitude of systems at work. The systems at work that I am most attracted to are those that resemble textile structures such as netting or lace. 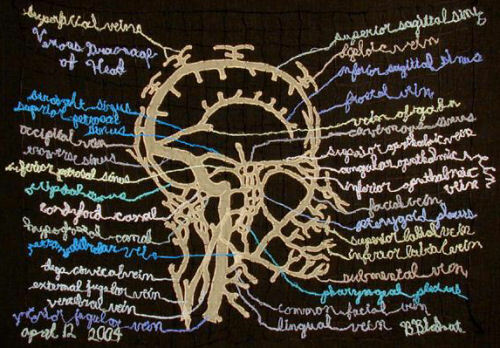 The lace-work that I create is constructed of a network of interlocking threads that relate to the networks or systems rendered: be it the network of the arteries to the brain or bits of the alphabet—a system for language. Hidden inside the body are complex structures and systems that keep us alive, breathing. 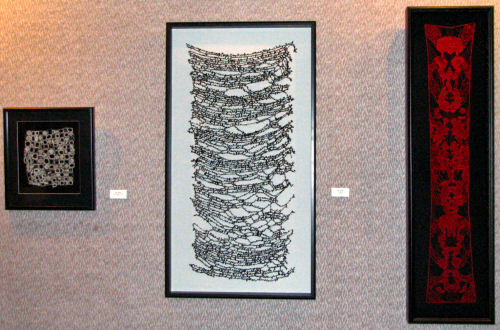 A number of the lace-work pieces exhibited here reflect my interest in the elusive human interior, where I find beauty and mystery. Similarly, the lace-work that shows the cellular structure of plants reflects my attraction to the patterns of the interior structures of all living things. I've long been interested in the contrasts between textual information and image-based information, and in many of my lace-works I try to strike a balance between the amount of image and the amount of text included in each piece. In the diagrams that I study and use as models for my lace-work, information is relayed by means of image and text. The magnified image reveals incredible detail and the text identifies those details. Neither text, nor image has greater importance; each plays a supportive role in providing detailed information. I’ve been fascinated by the possibilities of utilizing these two different types of information, and playing around with this balance. In some pieces, such as Ceremony, I’ve used only text—in this case the words spoken at my wedding ceremony. 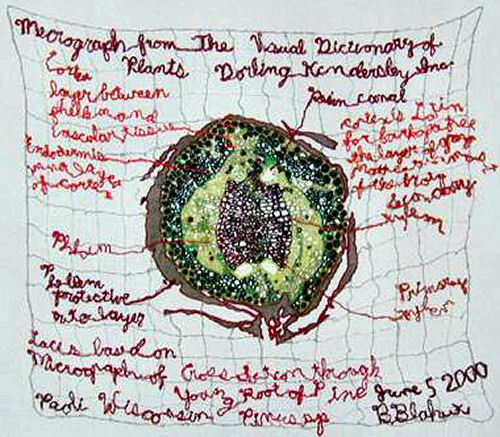 Others, such as Cross Section Through Stem of Deadnettle, include a detailed image, yet the text is invented—just scribbles that look like text. You will find that there is no text in the two Readers Digest works—only images. 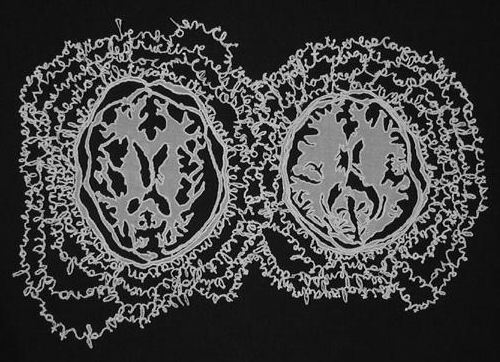 Those images resemble MRI images of the body, however they are derived from inkblots. Inkblots are images that one “reads” to reveal something about what is going on inside one's head. The title is often confused to be “Reader's Digest,” as in the possessive form of “reader,” and “digest” as in a journal. But my meaning is for “readers” as in the plural form of “reader” and “digest” as a verb, as in to flow through the digestive system. Each viewer takes in and “reads” these images in their own unique way. The pieces in my Aerial Landscape series are embroidered with a sewing machine and they are based upon drawings made while looking out of an airplane window at the agricultural landscape below. Unlike the lace-work pieces, which show patterns that are visible only under magnification, these landscape pieces show patterns that are seen at great distances. Man-made systems, those of agricultural practices, are revealed at these great distances. After doing these sketches I discovered that the circle within a square motif represents circular irrigation fields. By changing my point of view, I am continually engaged in seeing the world in new ways. The world abounds in beautiful patterns and structures—I aim to create textiles that embody the very same. I use a non-woven fabric that is made out of starch. The material dissolves in water and is available at fabric stores. People use it to make “cut-work” lace such as a lace collar. People also use it to stabilize delicate fabrics like silk while doing machine embroidery. I embroider on the surface of this fabric, developing many layers of threads stitched one on top of the other, to make the object structurally sound. Once I am done embroidering, I dissolve the backing away in a water bath. Then I carefully press the piece because otherwise the letters and words twist upside down and curl up and would be completely illegible. I leave some of the dissolved starch in the pieces—to stiffen them just slightly so they hold their shape a little better. I also incorporate fabric into the pieces. The fabric is in essence appliquéd to the starchy fabric and when dissolved away, what was “appliqué” becomes “cut-work” lace (cut-work is a piece of fabric that has had a pattern cut a way from it, and the edges are finished to prevent fraying). or if you have questions about the current one, contact Knitter's Treat . Ruth Sybers sponsors workshops in Monticello, featuring outstanding designers/teachers. To be informed of these workshops, request inclusion - knitterstreat@wekz.net In the subject line "add to workshop list".